As an administrator on a K-12 or higher education campus, you’ve doubtless spent sleepless nights worrying about protecting the safety of your students. You worry about securing campus property. It’s a big responsibility, one that requires the assistance of the entire campus population. For the past few years, statistics show overall campus crime is improving. Yet there’s been a spike in school shootings in 2018. While this increase may be an anomaly, it strongly reinforces the need for campuses to remain vigilant and continue to look for the best solutions to protect students and staff. Bad things can happen on good campuses. Administrators are responding to tragic events such as Columbine, Virginia Tech, and Parkland. They are also responding to parents who expect schools to protect their children. And many parents now put security on a level with academics when helping their college-age children choose a campus to attend. Security industry solutions – many of them developed for use on campuses – offer help. 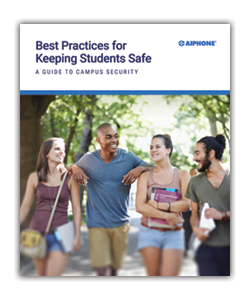 This eBook “Best Practices for Keeping Students Safe – A Guide to Campus Security” was created to provide you with a look at today’s options and best practices for securing a campus. It will give you a better understanding of the many facets of securing a campus – from choosing an integrator to setting up, operating, and maintaining electronic security systems and using environmental design to enhance safety.